In Vienna in the East of the city is the Prater, a former hunting area of the emperor. It is now a park land accessible to everybody. There are wooded areas meadows, ponds, swamp and coppices. When the writer was a child his mother took him on walks in the Prater to a densely wooded area. It was called “Mary in the Green.” There was an enormous beech tree which was covered with small pictures of Mary and other devotional mementos and thanks offerings. It was claimed that healing miracles had occurred by praying near this tree. When the writer went back to this tree seven years ago all the hundreds of pictures of Mary etc, were gone. There was only one small picture left, which helped him to recognise it as this particular tree. Church authorities had cleared away all the devotional objects. The writer dowsed a strong positive energy near the tree but had no idea what it was or what effect it had. During the same holiday when the writer revisited the tree, there was an esoteric congress taking place in Vienna. There were the usual stalls selling gem stones, crystals, there were palm readers, book sellers quite interesting but nothing that has not been seen before. But there was one stall to where the writer felt that there was important information. The stall sold products which were supposed to be loaded with an energy called tachyonic energy. There were silken scarves, there were gem stones, there were soles for shoes, there were silica disks etc., all loaded with this tachyonic energy, The writer bought some items at horrendous prices and a book explaining this form of zero energy or tachyonic energy which was supposed to have powerful positive effects. David Wagner, who discovered the process involving magnets to deliver this energy, wrote a book about it . In a veiled way it was revealed that meditation led him to this process of loading natural objects with his energy. Dowsing the products at home it was found there was a positive energy contained in these objects. The writer on a walk in the Prater passed the particular tree wearing the silk scarf acquired at the esoteric congress. Dowsing again in front of this tree it was found that there was the same energy near this tree as was contained in the silk scarf. On return to this country the writer investigated this energy phenomenon.. Map dowsing revealed there could be one point in Devon exuding energy similar to the energy in Vienna near this tree or in the objects acquired at this esoteric congress in Vienna. This point was supposed to be near South Molton approximately 20 miles away. On a fateful day a car journey was undertaken near this area. After the roundabout leading to South Molton there is a turning off the main link road to Mornacoft. About a mile up of this country road in deepest Devon was a path which led over a rotting bridge into a dark pine wood with fallen tree trunks with fallen tree trunks, water filled ditches and swampy areas. By dowsing in the middle of a swampy, squelchy area an energy centre was found from which emanated an energy which corresponded to the energy of the silk scarf bought at the esoteric congress in Vienna. The energy was concentrated on a point in the form of an egg, the broad end of the egg turned exactly North and the pointed end of the egg facing South. A definite energy beam could be dowsed which came from North at an angle of about 51 degrees and formed this egg shaped power point about 54 cm long and 44 cm broad. Two energy “lines ” 44 cm wide emerged on both ends of the point and went off on a irregular course. Dowsing revealed that this point in the swamp was basically very positive but it also indicated a lot of negativity. As there was this distinctive energy beam coming from above to form this power point this point is called from now on ” cosmic point”. The writer stood on the point for about 5 minutes, first he felt elation in some ways but after an hour general malaise depression, localised pains, flaring up of old problems etc., came about . This lasted for days. This cosmic point was visited at infrequent intervals over several years. It was disappointing that with every visit negative feelings and symptoms were experienced. Inherently the point always responded at being extremely positive and good, but any stay on it caused problems. Plastic bottles filled with water were set upon the point and collected at the next visit, but no energy was transmitted. Only at a later date a glass bottle was used and then energy was dowsed to be transmitted to water to a very high degree. Using this loaded water by drinking it or pouring it over the body caused in some way very beneficial feeling but after a while severe symptoms set in. The power of this X point was so strong that water which was loaded with the inherent positive energy also accepted the negativity of the diverted radiaesthesic energies. Over a dozen different types of radiaesthesic stress phenomena were dowsed to go over this point. It was a completely unnatural dense concentration of negative geopathic stress over this cosmic point. Some of the lines which crossed over the point some were followed over longer stretches. It was observed that e.g. Curry lines were diverted from their normal course in order to cross the cosmic point and then returned to their normal course. A search for a nearer better cosmic power point of this kind was instituted . Strangely enough a cosmic power point was found on the eastern part of Bideford near the Tarka Trail. It was also in a swampy area difficult to access because of thick brambles. But eventually the point was found. There were no diverted lines but as the writer did not want to get another unhealthy load of radiaesthesic rubbish water was loaded on this power point. Germination experiments were done with cress. But soon it was seen that the seeds watered with loaded water from the point were doing very poorly, ordinary Bideford tap water did better. Then the penny dropped. This was a cosmic power point but of negative character. The form and size was the same as the positive point only the broad side of the egg form pointed South. Could it have been that the dowsing question if this point was positive, was answered ‘yes’, because from an overall view negative cosmic points have a positive function. No investigation was done about the type of energy produced by this negative point. Who made the concentration of diverted lines on the positive power point? It must have been a very knowledgeable person or persons. 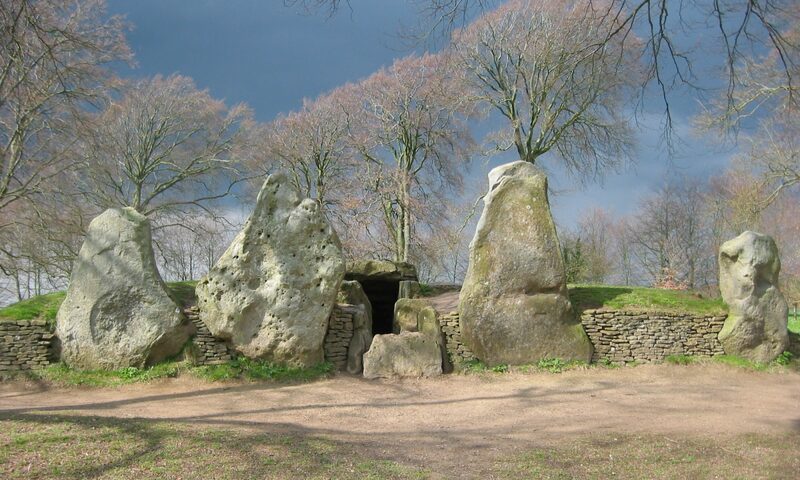 In former times Devon was a stronghold of the druids. The area where this positive cosmic point was located was never conquered by the Roman legions. The Druids of eastern England, if they were not killed by the Romans, fled to the West. In spite of their general tolerance for other religions the Romans made an exception with the religion of the druids. They persecuted druid priests mercilessly. It might have something to do with the powerful curses the Druids were able to pronounce against their enemies. There were instances of mutiny in the Roman legions caused by fear of druid curses. Later the Christian missionaries arrived who had no liking for the druids and built chapels on places hallowed to the druids. It is presumed that the Druids as a last act of revenge spoke curses over beneficial points and laid geopathic stress lines etc over them, especially over this powerful cosmic point. Collection of geopathic negative lines was often dowsed by the writer in North Devon churches. Hardly any church exists in this area where the beneficial points, usually near the communion rail, are not spoilt. But the worst point the writer ever met was the positive cosmic point in question it was not only normal ordinary geopathic stress in abundance. On this particular point must have been set a multiplicity of intransigent “curses” of a higher order. After standing on the point the writer experienced attacks in the aura and felt presences etc. This was worrying and very difficult to remove. Any efforts to clear this cosmic point of its negativity were in vain. As said before there seems only positive cosmic point in Devon, none in Cornwall. It seems these points are very rare, they are interconnected forming a network. It could be compared to acupuncture points connected by meridians. It is difficult to say if the energy produced by these cosmic points is the same energy which David Wagner describes in his book as tachyonic energy or zero point energy. There are a number of physicist who described the effects of zero energy. It is called sometimes Feinberg Field after the physicist who first described it. It is also called tachyonic energy because the particles of this zero energy are faster than light. David Wagner keeps secret the process of tachyonizing his products. There is talk in his book being led by meditation and higher inspiration to the construction of a tachionic machine. There are fantastic claims about this zero point tachyonic energy especially in the field of healing. The writer thinks that the energy produced by this cosmic point in Devon might be tachyonic energy, but evidence is only by dowsing. As this cosmic point has been spoilt in former times any beneficial effect was overshadowed by the existing variegated negative load.